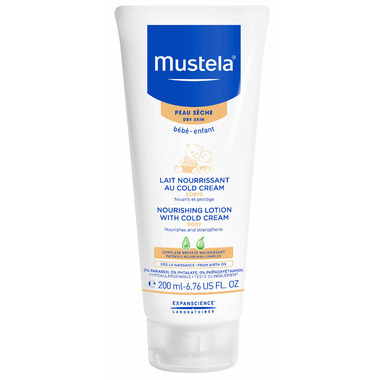 Mustela Nourishing Lotion with Cold Cream immediately nourishes and moisturizes dry skin, with long-lasting effect. Mustela Nourishing Lotion with Cold Cream restores the skin moisture barrier, and preserves the skin's richness of the newborn, including newborns out of the NICU, baby, and child, thanks to active natural ingredient Avocado Perseose®. Free of paraben, phthalate, phenoxyethanol. Preserves the skin moisture barrier and has a long-lasting moisturizing effect. Rich and creamy texture, ideal for dry body skin. Hydrates winter chapped skin well. Absorbs nicely.